63 yrs old female was operated with bilateral Total Knee Replacement in 2011 complaints of pain in left knee for the past 2 yrs with difficulty in walking and sitting. X-Rays showed the loosening of tibial component while femoral side was alright. Her blood parameters were within normal limits and skin shows no signs of infection. Thus planned for revision TKR with both femoral and tibial components. 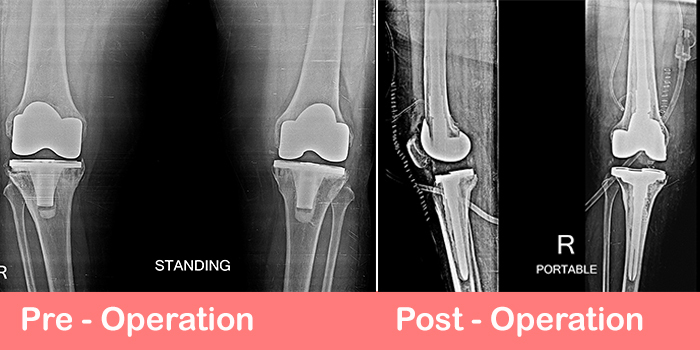 Post operation X-Rays showing revision TKR with stem extension on both sides with medial distal augmentation was done on femoral side Now patient is walking comfortably.